As a soloist, Antje Weithaas has worked with most of Germany’s leading orchestras, including the Deutsches Symphonie-Orchester Berlin, Bamberg Symphony and the major German radio orchestras, numerous major international orchestras such as the Los Angeles Philharmonic, San Francisco Symphony, Philharmonia Orchestra and the BBC Symphony, as well as and the leading orchestras of the Netherlands, Scandinavia, and Asia. She has collaborated with the illustrious conductors Vladimir Ashkenazy, Dmitri Kitayenko, Sir Neville Marriner, Marc Albrecht, Yakov Kreizberg, Sakari Oramo and Carlos Kalmar. Highlights of the 2018/19 season include performances with Het Residentie Orkest under Otto Tausk (Gubaidulina Offertorium), Het Gelders Orkest under Antonello Manacorda (Bruch 1), the MDR-Sinfonieorchester under Klaus Mäkela in Leipzig and Ludwigsburg (Beethoven), the Estonian National Symphony Orchestra under Olari Elts (Brahms), the Poznan Philharmonic Orchestra under Eivind Gullberg-Jensen (Beethoven) and the NDR Radiophilharmonie under Andrew Manze (Bruch 1). With her infectious zest for communication, Antje Weithaas‘ reputation for inspiring play-lead concerts is rapidly growing. Having been the Camerata Bern’s artistic director for almost ten years, she was responsible for the ensemble’s musical profile, leading large works such as Beethoven’s symphonies, and recording music by Tchaikovsky, Brahms, Mendelssohn and Beethoven. She will continue this close collaboration and also enjoys ongoing relationships with the Swedish Chamber Orchester, the Norwegian Chamber Orchestra, the Academy of Taiwan Strings, the Orquesta Da Camera Barcelona and the Kammerakademie Potsdam. In May 2018, her musical versatility was showcased in an artistic residency at the Schwetzingen SWR Festival. The Arcanto Quartet, in which she performed with fellow violinist Daniel Sepec, violist Tabea Zimmermann and cellist Jean-Guihen Queyras, has been particularly important to Antje Weithaas as a chamber musician. They have released CDs on the label Harmonia Mundi of works by Bartók, Brahms, Ravel, Dutilleux, Debussy, Schubert and Mozart. Antje Weithaas produced a reference recording of Beethoven and Berg’s violin concertos in 2013 with the Stavanger Symphony Orchestra under Steven Sloane (CAvi-music). There were rave reviews for Antje Weithaas’ latest project for CAvi: the complete recordings of Johann Sebastian Bach’s solo sonatas and partitas and Eugène Ysaÿe’s solo sonatas, which was recently completed. The label cpo released her recordings of Max Bruch’s complete works for violin and orchestra with the NDR Radio Philharmonic under Hermann Bäumer to great acclaim. Antje Weithaas continues her collaboration with the NDR Radio Philharmonic and cpo with recordings of Schumann’s Violin Concerto and Brahms’ Double Concerto with Maximilian Hornung, both conducted by Andrew Manze. Antje Weithaas began playing the violin at the age of four and later studied at the Hochschule für Musik “Hanns Eisler” Berlin with Professor Werner Scholz. She won the Kreisler Competition in Graz in 1987 and the Bach Competition in Leipzig in 1988, as well as the Hanover International Violin Competition in 1991. 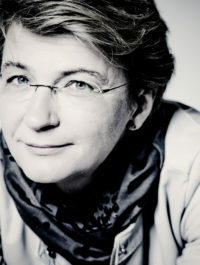 After teaching at the Universität der Künste Berlin, Antje Weithaas became a professor of violin at the Hochschule für Musik “Hanns Eisler” in 2004. She plays on a 2001 Peter Greiner violin.